The Spanish projects of the wpd Torozos portfolio are now taking on concrete dimensions: In early September, the company ordered 39 Siemens Gamesa wind turbines of Type SG 3.4-132 with a nominal output of 135 MW. 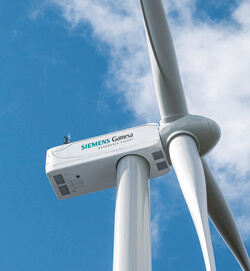 The next step is the construction of the turbines, which is to be completed by fall of 2019. This is the first phase of the portfolio, which in total encompasses 200 MW. The second phase with 65 MW is to be built immediately after and also go live by the end of 2019. The electrical infrastructure for the whole project will also be installed during the first phase. “wpd has been active in Spain for many years. Since the beginning, we have successfully developed 240 MW with our local team there,” explains Dr. Gernot Blanke, Member of the Board at wpd AG. Since 2012, however, conditions on the Spanish market have been difficult, and for about four years there had been virtually no new construction of renewable energy systems. “But we always believed in the great potential of that market, and are very pleased that our tenacity is now paying off, as we are now able to build the Torozos wind farms. It is another great success for wpd in the international wind onshore sector,” says Dr. Gernot Blanke. The wind farms will be built on the high plateau of Torozos in Castilla y León. This region is considered the driving force behind the Spanish energy transformation: It is already producing more wind energy than any other region of Spain. The Torozos projects share a grid connection at La Mudarra, the largest substation in the Northeast of the country. That connection was secured back in 2015.
wpd was awarded the contract to build the wind farms in the summer of 2017 following Spain’s third call for tenders for renewable energies. The Spanish government had invited bids for a total of five GW of wind technology, to bring the nation closer to its goal of producing 20% of its electricity from renewable sources by 2020.